Fries before guys is for real. And all the more so because we now have a brand new fries joint in our town telling us just that! 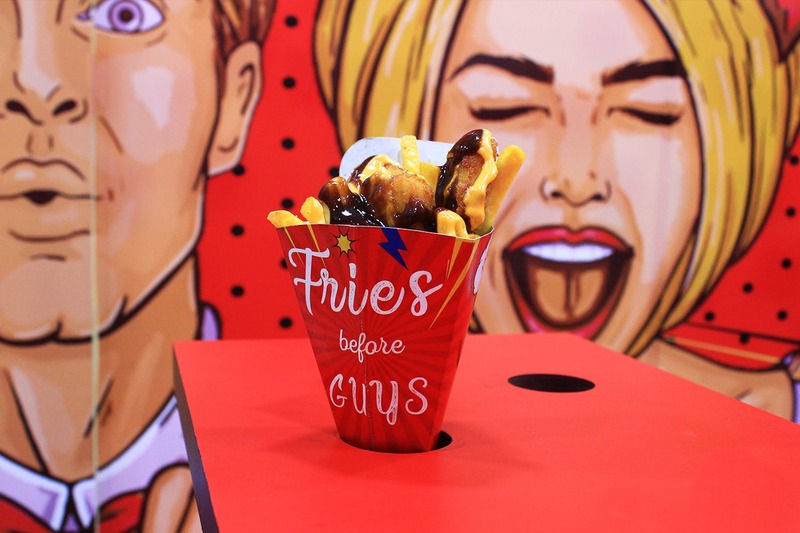 Kolkata has a new fries joint and it’s called Fries Before Guys! They have a gazzilion different types of fries. From regular fries to masala ones you can add up to fifteen different sauces to match your mood and the match scores. Take your pick between veg and non-veg options because there’s a whole lotta things you can add to your fries. Cheese corn poppers, nuggets, sausages, shredded chicken, chicken popcorn—the toppings list just goes on. Don’t give the BBQ schezwan fries a miss, and the Magic Maggi fries are a must try. Their red and yellow interiors with pop art of men and women holding their fries are really funky. Served in cones, the fries are all priced between INR 100 and INR 200. And folks, keep your eyes peeled because another outlet is coming up around May in Bhawanipore. Pocket Pinch (for two): INR 300.